Join together in song, at either our 9:30am Sunday Mass, or our 5:30pm Mass on Sunday evening. Our 9:30am Mass is more traditional church music, directed by John Maher. 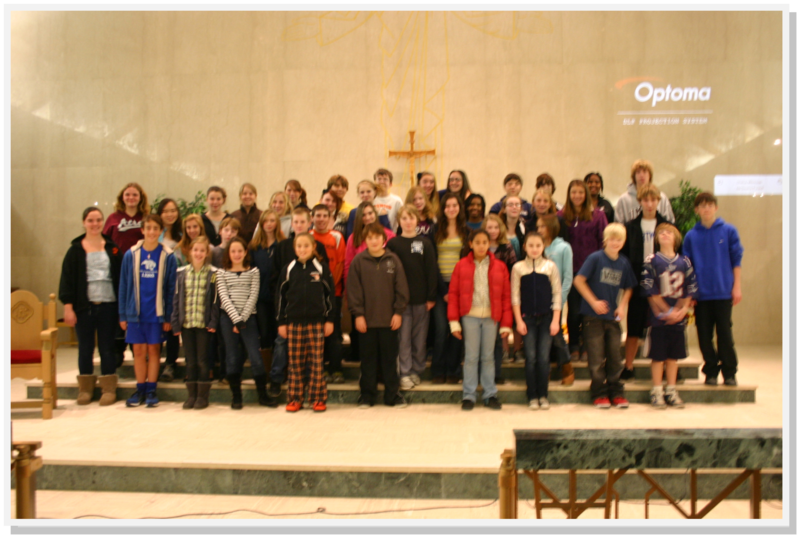 A short rehearsal is held each week before Mass at 8:45am -- other practice time is scheduled as needed. Contact John Maher at johnmaheripswich@gmail.comt or 978-500-6789 for more information. Rehearsals for Sunday night begin an hour before Mass at 4:30pm. To sing or play at our Sunday evening Mass, with more contemporary music, please contact John Maher at the email or phone number above. All women are welcome! Click here for more information. Unite as a community praying the Rosary for world peace. Recitation of the Scriptural Rosary begins at 7pm each Tuesday night in the church. No experience required. All are welcome! If interested in any of these ministries, please contact the Rectory or call 978-356-3944. Non perishable foods are collected at the back of the church each week, and brought by parishioner volunteers to the Ipswich Food Pantry for distribution to those in need. The PPC is involved in most activities and programs effecting the liturgical and spiritual life of Our Lady of Hope Parish. "Ipswich Dinnerbell is a non-profit cooperation of Churches and Community organizations that exists with a shared love of God and neighbor to serve hot, nutritious meals, free to all who come, and create a mealtime atmosphere of fellowship with one another." 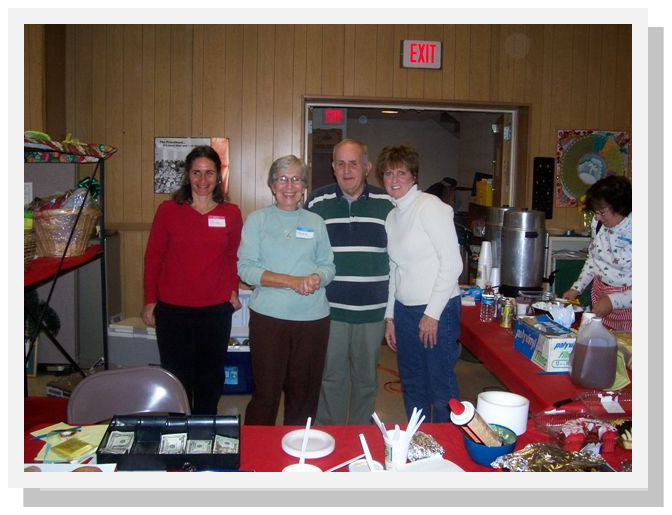 Our Lady of Hope periodically sponsors Dinnerbell meals, and help is always needed. Contact Dorothy Calandra at 978-356-4801 to volunteer, or for more information. Also, visit their website at http://ipswichdinnerbell.org/. Founded in 1948, the St. Vincent de Paul Society has strived to administer to the poor and needy of the parish. The work of the Vincentians is funded solely by the contributions deposited in the St. Vincent de Paul boxes at the exits of the church. The need is great, and men and women to become Vincentians and carry on this important work are welcome- as are any donations to help those in need. If you are in need of assistance, please contact the rectory at 978-356-3944. If you can help, visit our conference's website for more information on Our Lady of Hope's group: http://svdpipswich.blogspot.com/. All men are welcome! Meetings are held every Saturday morning at 7am in the church hall. Join us for coffee, a light breakfast, socialization, and engaging (no pressure) conversation about our faith in a relaxed environment. Questions? Call the rectory at 978-356-3944. Offered throughout the year, Bible Study is open to all, both in the evening, at 6:30pm Thursday nights, and morning, 9:30am Friday mornings. Different books of the Bible are studied every few months. Check the bulletin for our current offerings, or contact Amy Kostak. We have an active Cursillo community here at Our Lady of Hope, with an Ultreya group meeting on the first Friday evening of each month, when there is a Cursillo weekend. 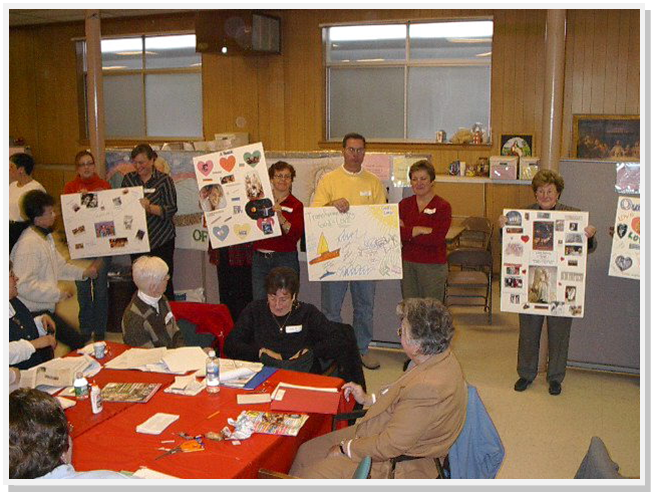 For more information on making a Cursillo retreat, or Ultreya, reach Charlie or Ann Davidson at 978-204-8320, and check out http://saintbasils.org/html/cursillo.html. Join us Wednesday nights at 7 pm in the Lower Rectory (come in through the church hall) to pray Liturgy of the Hours (guides provided for new members), and offer intercessory prayer for the needs of our parish. Extraordinary Ministers of Communion who serve the Body and Blood of Christ at Mass and to the sick and homebound. If you're interested in serving as a Eucharistic Minister, please contact Fr. Tom Keyes. Readers who proclaim the Scriptures at Mass and other services. Contact Fr. Tom Keyes for more information. Rite of Christian Initiation – preparation of adult candidates for Catholic sacraments. If you, or someone you know is interested in more information about the Catholic faith, or considering becoming a Catholic, feel free to contact Fr. Tom Keyes for more information, and check here for an overview of the RCIA. Our Lady of Hope parishioners are invited to participate in outreach with Family Promise North Shore, helping serve homeless families as they get a leg up and a new start here in our local area. Click here for more information on the work they do, and how you can help.